There are many things that make birthdays special: friends, family, presents, food… the list goes on. My favorite part of a birthday is the cake. I’m not sure what the exact reason is. It may be because it’s the centerpiece of a celebration or because it foreshadows the inevitable sweet ending of a party or simply because I love cake. I did not have many birthday parties when I was little, but I do remember seeing many beautiful cakes at American bakeries wishing I would have one for my birthday. I always ended up getting a Korean cake. By Korean cake, I mean a simple sponge cake filled with whipped cream and fruit and a simple decoration on top. (I have to say, Korean bakeries have stepped up their decorating game since I was a little kid.) Many a day did I wish for the sugary sweet American buttercream counterpart but it just didn’t happen. So that’s why when it’s someone’s birthday I try to make it special the only way I know how, with cake. Andy’s niece LOVES Sofia the First, along with Minnie Mouse and Max & Ruby. I’ve always wanted to try my hand at doll cakes so the present was twofold: the cake and the doll in one. 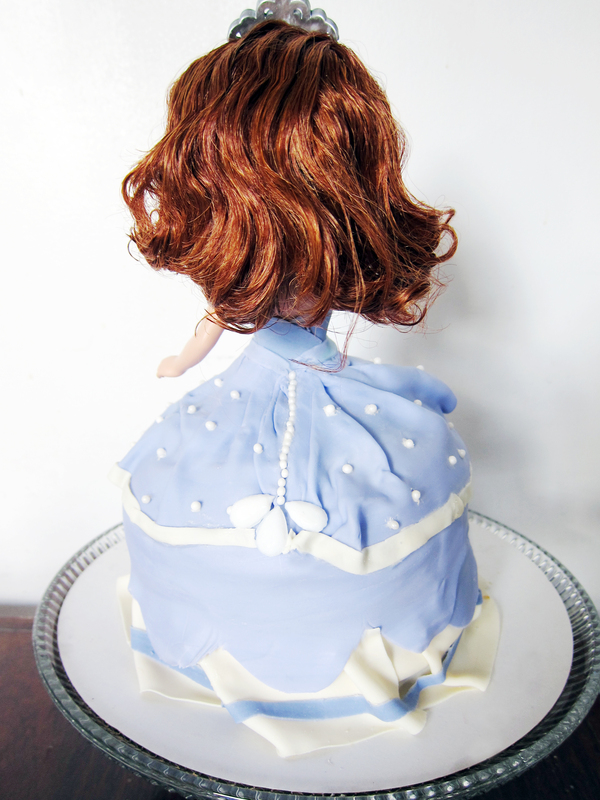 Cut out holes in the cake layers so that it would fit your doll. I used this doll. Prep your doll by tying its hair up, taking off the dress, and wrapping the doll with plastic wrap. Frost and layer the cake layers and place your doll inside. 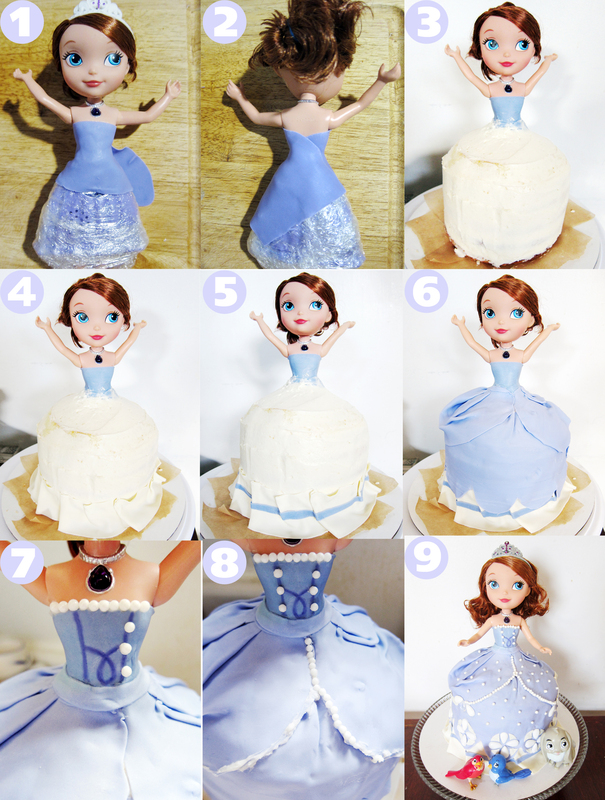 Mold the cake into a dress shape by cutting it along the top in a rounded shape. Roll and cut a thin ribbon of fondant and wrap around the waist to meld the top and bottom together. Optional: If you have time, you can continue the pearl all across the back of the dress. I did not so I opted to continue it with a white ribbon made of white fondant. Cut out the pattern with the fondant and adhere it. Make white teardrop jewels with a small gem mold with either sugar or isomalt. This gives it an interesting 3D effect to the dress. You can cut out the triangular shapes with fondant and adhere it. 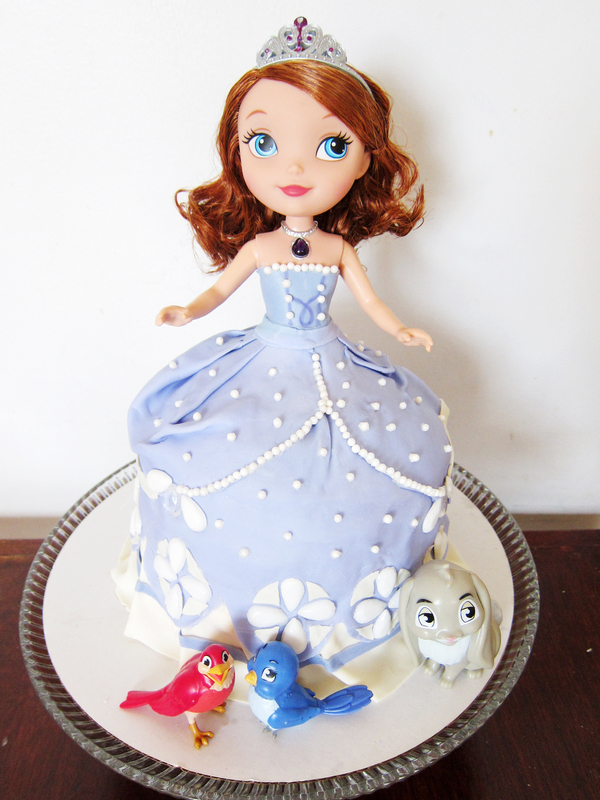 This entry was posted in Cakes, Desserts, Disney, Holidays, Parties and tagged birthday, cakes, dessert, disney, Holidays, sofia the first. Bookmark the permalink. 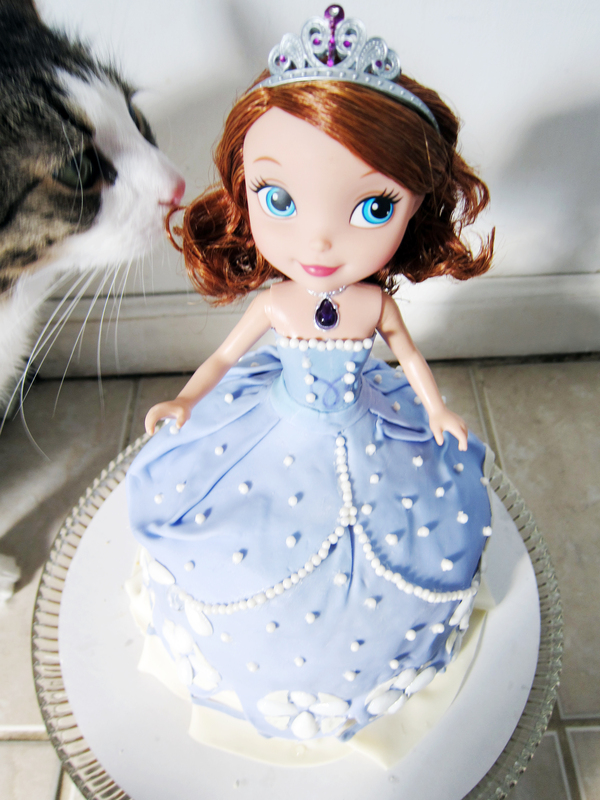 This is the cutest cake ever! Oh, how I wish my daughter was still into Disney and princesses. I hate that they have to grow up! This looks so good! And how sweet of you to make it for your niece–I can just imagine how much she loved it! 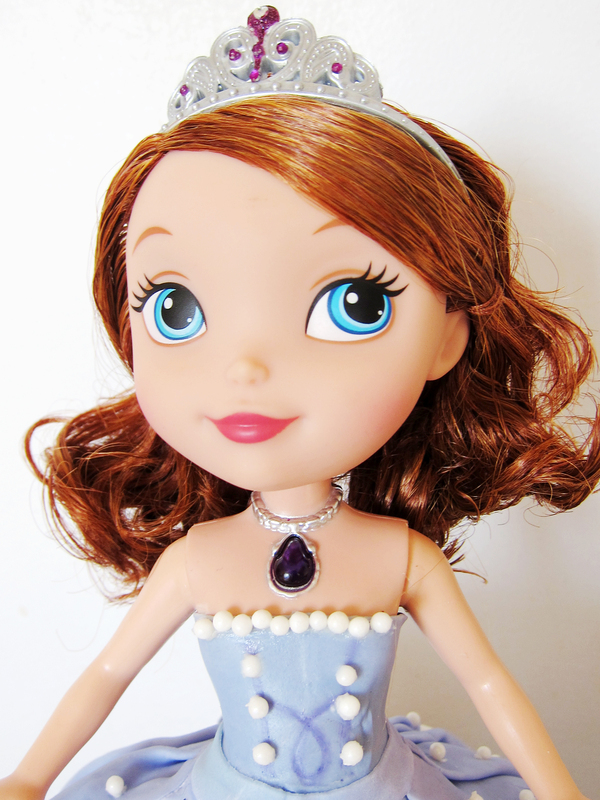 lovely.. how many inches is that sofia the first doll?